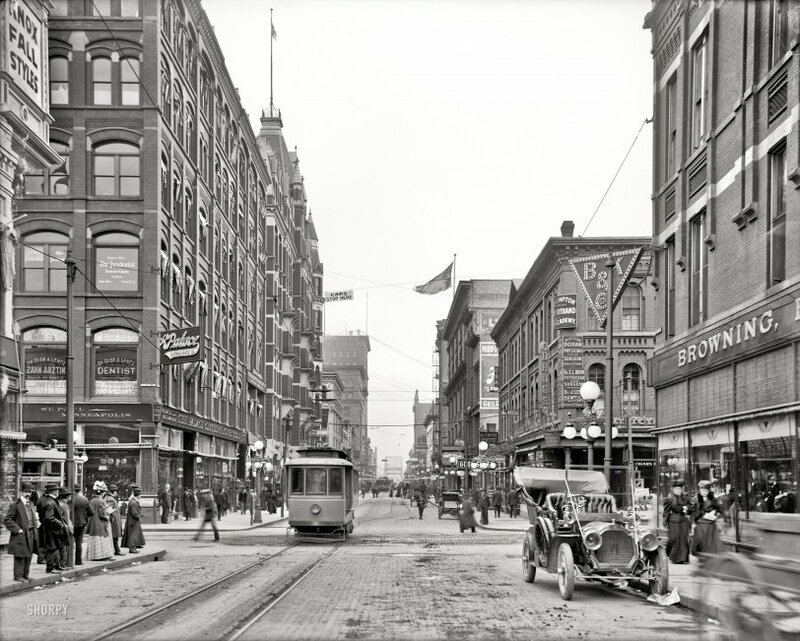 St. Paul, Minn., circa 1908. "Robert Street." With dental parlors in Starbucksian abundance. 8x10 inch glass negative, Detroit Publishing Co. View full size. Submitted by Rex_Temperis on Sun, 04/24/2011 - 12:01pm. A time traveler from the past would be lost here. I see maybe 2-3 buildings that haven't changed. I wonder what another 100+ will look like. Submitted by jsmakbkr on Sun, 04/24/2011 - 11:42am. 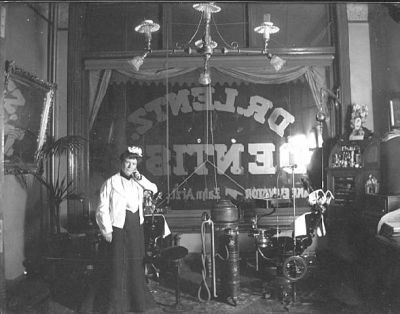 Dr. Olga Lentz, shown here in her full glory. Submitted by Sawney Beane on Sun, 04/24/2011 - 7:56am. Submitted by jsmakbkr on Sun, 04/24/2011 - 7:22am. 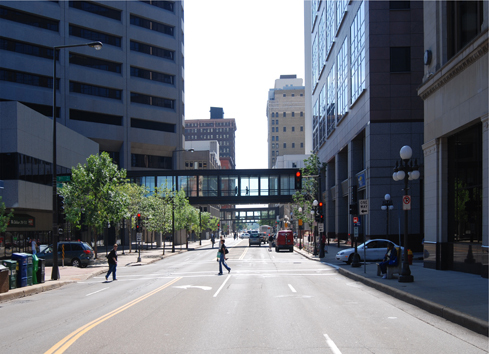 Today, pedestrian traffic has abandoned Robert Street in favor of the skyways, except for those who waiting for a bus. The foreground has become, on both sides, the Securian Center - reflecting a successful effort at assembling enough contiguous class A office space and parking to host a corporate campus downtown. One building in the picture is standing today - the seven-story Manhattan Building (now known as the Empire Building) on the left side. Four of its historically-registered floors are visible above the Segal Shoes sign. Submitted by roverdriver on Sun, 04/24/2011 - 3:59am. Looks to me like a Packard of about 1906, possibly a model S.
Submitted by Stefan on Sun, 04/24/2011 - 2:31am. I lived in Minnesota for most of the 1980s, and there were still middle aged people who grew up remembering German as a first language in some of the smaller towns. Submitted by Richietwo on Sat, 04/23/2011 - 11:28pm. The picture below should make it abundantly clear that Dr. Lentz is all business. So sit back in the dental chair and open wide but Please, with a capital P that rhymes with T and that stands for Trouble! Right here in St. Paul. Please don't ogle Olga. Where did the Packard go? Submitted by DrDetroit on Sat, 04/23/2011 - 6:45pm. I always like the before and after photos taken in the same location. However, I miss the 1907 Packard Model 30 that is in the lower right of the original photo. Submitted by aenthal on Sat, 04/23/2011 - 5:28pm. I want George Jetson's time machine so I can go step into this scene. I know he has one because the only way any car can obey the "cars stop here" sign is if they are flying ones. I want his bubble car and I want his time machine, and I want them now. Submitted by kvenido on Sat, 04/23/2011 - 5:12pm. And what happened to all the people that used to bustle about this street, I wonder. Maybe 5-7 people tops can be seen in the 2011 shot, as opposed to 40 to 50 people in 1908. Interesting. Submitted by tcrosse on Sat, 04/23/2011 - 1:43pm. That's the Ryan Hotel on the left, dismantled in 1962. Submitted by TimeAndAgainPhoto on Sat, 04/23/2011 - 1:24pm. Below is the same view, looking south from 7th, taken in September of 2008. Submitted by deemery on Sat, 04/23/2011 - 1:16pm. 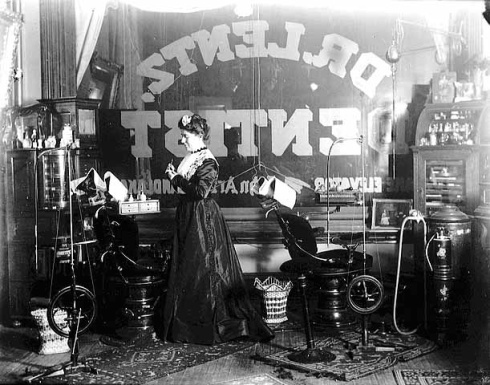 But a lady dentist strikes me as much more unusual. Submitted by noelani on Sat, 04/23/2011 - 1:09pm. Every time I see a picture from 1908, I think of my beloved grandfather, who was born on Dec. 16 of that year. He said that it was the best time anyone could have been born (for reasons obvious to us history buffs, here on Shorpy). The last time I saw him, he reminded me of that, and what a great life he'd had. He apparently knew that he would be joining Grandma in the hereafter, soon, and didn't want me to be sad. He died a few months later, at the age of 83. Submitted by Jimmy Longshanks on Sat, 04/23/2011 - 12:33pm. The same view today from Seventh and Robert. In the old photo, the first Robert Street bridge, completed in 1885, can be seen in the distance. Submitted by OTY on Sat, 04/23/2011 - 12:24pm. This title has nothing to do with the picture, but the abundance of dentists seems to have crowded out all the chop suey parlors (what the heck is he talking about?). Olga in the title was a fast and loose young lady immigrant, a real person from my teen years who was in high demand as a date and that is all I'll say about that. 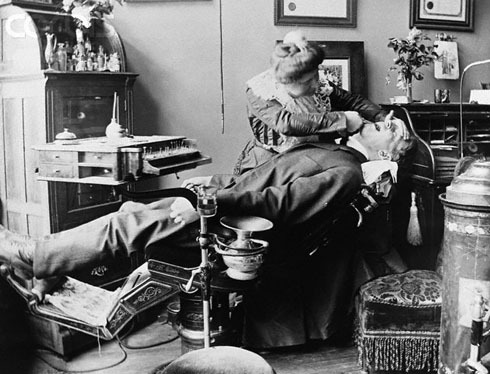 As for dentists, my father used to have his teeth repaired by a co-worker in a factory who had dabbled in dentistry and did his "practicing" in his home kitchen, very inexpensive and no painkillers. He also removed my dad's nasal polyps for him cheap. Ah, the good old days.